American Protective League: Before Hoover took over the FBI, the APL was investigating food hoarders and spies. This 1918 letter, from a member of a citizens’ vigilante group calling itself the American Protective League to an official of the wartime U.S. Food Administration, reported on a food stash found in a Berkeley, Calif., home. The Foran family, “reported to be hoarding food,” had “25 or 30 cases of foodstuffs” in their basement, including cans of such staples as corn, peaches, pork and beans, as well as a supply of plum pudding, pimientos, and beer. Mrs. Foran protested that she had carefully followed rationing rules in her purchase of flour and sugar and explained that the family possessed so many canned goods because the father bought food wholesale every year. While no action probably resulted from this raid, as the Forans were able to prove that they’d followed rationing guidelines, it’s astonishing to a modern reader to see that it was legal for a citizen group to enter another citizen’s home on the strength of a tip. Historian Joan Jensen writes that the Protective League flourished because the attorney general, Thomas Watt Gregory, wanted to expand the authority of his Bureau of Investigation (which would later become the FBI). Desperate to make spectacular busts of German spies living inside the United States borders, Gregory authorized a Chicago advertising executive to bring together a group of volunteers—mostly businessmen—to help investigate suspects. The organization issued its own badges and awarded its members ranks and medals. In practice, rather than bring in German spies, the APL ended up carrying out more prosaic missions: ferreting out food hoarders, hunting down draft-dodgers, and “protecting” factories with government contracts (which often meant union-busting). In 1919, with the war safely over, Attorney General Gregory—who had begun to worry about the APL’s authority in the lives of everyday citizens—dismissed its members from service. 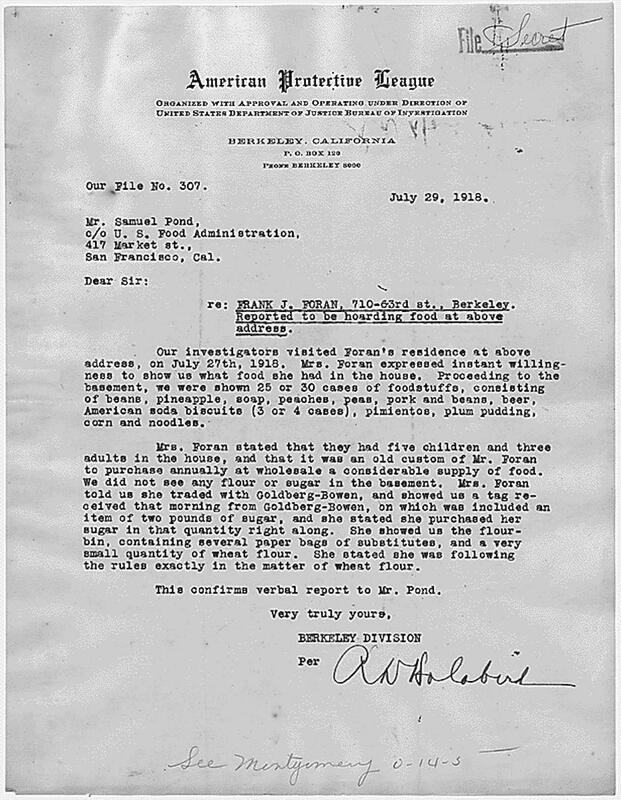 “American Protective League to U.S. Food Administration re: Frank J. Foran, 7/29/1918.” National Archives.